Residence Solutions | GCI - Global Citizenship Investment. We are the world's leading experts in advising foreign investors on Citizenship & Residency by Investment. The Consultant Middle East believes and considers that any individual who wishes to enlarge his life and business limitations can apply for another citizenship and can rely on our experts to conduct all the implied process. Beside a very professional way of managing each case, the client can obtain also freedom to travel, security and more privacy. We provide the best solution for each customer and advise him from all relevant perspectives. Our vast expertise into this matters will highlight the opportunities and guide him to the proper program, taking into consideration all life and business aspects. Our main strategy is to ease and speed up the entire process for our customer, providing him with a valuable dedicated expert team for any legal and personal issues, banking and tax rules, having assigned a manager who will coordinate everything on client’s behalf. Once you decide to establish your business or life in another country, you will need reliable people and entities in which you can trust and smooth the entire process. Our powerful high level contacts and partnerships will bring a huge support to your new life and desired business. Our team is daily updated and well prepared to manage the best solutions for our customers and their families together with their worldwide trusted advisers. As a Private and Corporate Wealth Management Experts we sustain the most suitable choices for our private individuals and corporate entities such as law firms, banks and global financial advisers. The Consultant Middle East is covering all necessary and complimentary services, ensuring a worldwide platform for each foreign individual to achieve his relocation and immigration process. 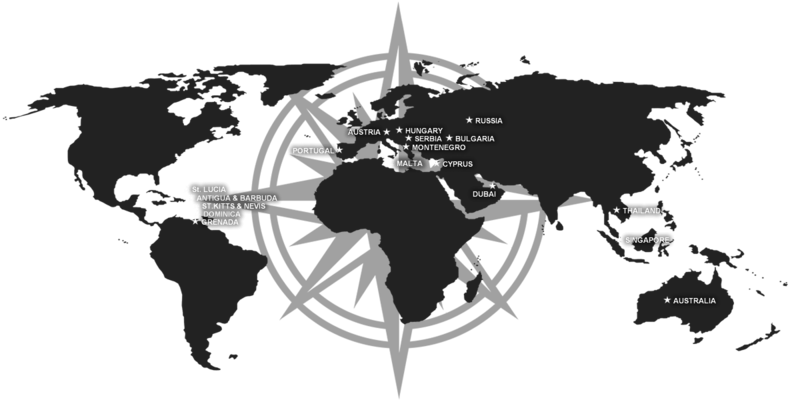 The Consultant Middle East - reliable consultant for govermnments around the globe. Together with high and successful performances during the time for our individual and private customers, we reach to a point that our expertise is needed also for specific governmental advisory area. Our implemented strategies are required by such agencies to develop and open practise in different domains as legal, economic and real estate. We open doors and encourage such state entities to create and develop special programs, enhancing the right possibilities and attractive points for each specific country. There are many possibilities to start new businesses or open branches in other countries and this can lead to obtain a residence permit fulfilling special requested criteria. Nevertheless the simplicity or complexity of the process, the immigration and tax rules and policies are most of time complicated and on a continuous revision from authorities’ side. IF you are not familiar enough with all legal terms and implied actions, you can loose considerable precious time and money during all the establishing phases. To use an experienced professional is crucial and can save you lot of capital and wealth, including a better chance to get faster approvals. The Consultant Middle East is one of the leaders in obtaining residence and citizenship by applying into designated investment programs and the entire list of managed countries can be found below.